Donald Trump is still at the epicenter of the 2016 U.S. Election. Though he is currently ca. 6 % points behind Clinton in national polls, no other presidential candidate can match him for sheer entertainment value. He knows how to keep the spotlight focused on him, whether positive or negative. We will shortly cover his progression from glorious media darling to the candidate many media organizations now want to bury. But when he announced his presidential candidacy on June 16, 2015, complete with all the fanfare at Trump Plaza in New York, and only one day after the expected GOP front-runner Jeb Bush announced his candidacy, pundit Ian Bremmer headlined it this way: “How Donald Trump Stole Jeb Bush’s Moment.” This was both correct and prescient. In a crowded field that grew to 17 contenders, Donald Trump kept vanquishing all his GOP opponents and stealing all their moments – right up to the GOP Convention ending July 21, 2016, which officially launched him as the GOP nominee. Corporate media focus has been on Trump to the exclusion of most other candidates, including any serious scrutiny of Hillary Clinton. Now the breathless anticipation is about how much and how soon Trump will fall to Clinton. In the Vedic system, politics are guided by Venus, planet of attraction and the ability to magnetize others to us. In Vedic myth, Venus as Shukra is considered the inventor of political science and composed the Shukraniti, the most famous code of behavior and politics in Vedic literature. Trump’s charisma can be described astrologically in at least two ways: 1) his potent Full Moon birth chart and timing to it; and 2) the commodification of corporate media in the present era, i.e. information as a product to be sold, whether or not the contents are factually correct, unbiased, or merit serious attention. The key is Profit, not the Public Good, though it masquerades as such. And if the media distorts the facts, should we be surprised when the candidates follow suit? Since Dec. 2015 I have said “the mainstream media plays a larger than ever role in the unfolding of the 2016 American presidential campaign.” See https://edithhathaway.com/trump-it-up/#more-625 I describe how this happens in the long term with the weakening of Jupiter (journalism, education, nation-states) and the increased power of Saturn (business, corporations, weapons industries) during the EARTH period, when Jupiter-Saturn conjunctions predominate in sidereal EARTH signs. The FIRE to EARTH Mutation period runs 1901-1961; the Post Mutation EARTH period: 1961-2199. The triple conjunctions in Virgo 1980-1981 were also major triggers in both accelerating and corporatizing the Information Age. Reviewing 2015-2016, we note the effects of Jupiter (journalism) and Rahu (renegade, heretic) conjoined in Leo from Jan. 9 through Aug. 11, 2016, and Jupiter in Leo for 13 months: July 14, 2015 to Aug. 11, 2016. Due to his strong Leo Ascendant birth chart, also benefiting from the Jupiter transit in Leo, I predicted in Dec. 2015 that Trump would be the likely GOP nominee. Famed pollster Nate Silver put Trump’s chances at 2% (Aug. 2015), at 5% (Sept. 2015), 6% in Nov. 2015, 7% in early Dec. 2015, and 12 to 13% in early Jan. 2016. Silver was hardly alone in those estimates. In Dec. 2015 I also said that Trump’s favorable timing would take a downturn after Jupiter exited Leo and he approached the end of his 18-year Rahu Dasha Nov. 16, 2016. This still holds true even with the Anti-establishment theme prevalent for all of the primary season. The last JU-SA square chart in May 2016 also indicated the likelihood of the incumbent party retaining the White House, and we see how President Obama is playing a major role to support Clinton and attack Trump. When information becomes a commodity, and news becomes entertainment, the corporate media succeeds in creating higher ratings and profits for the media industry, but also a kind of political theatre in which Donald Trump wins all the casting calls. And when you are more of an entertainer than a politician, you may escape being judged strictly as a politician. Trump is either a trailblazer or an anomaly in this regard, and also in the way he has run away with one of the two major U.S. political parties, turning it into his own brand, amplified by himself and his family. In her own way as well, Hillary Clinton has become THE Democratic Party. This was confirmed by the leaked emails from Wikileaks from the Democratic National Committee (DNC), and how closely it had become a virtual wing of the Clinton campaign on many levels, thereby violating the DNC’s own by-laws to act as a neutral custodian of the party. This made any competition so impossible that when Bernie Sanders did in fact win many, many primary states, a multitude of people acting to benefit the Clinton campaign went further and stole votes from Sanders in every possible way. For further documentation, please see https://edithhathaway.com/election-update-june-27-2016/#more-1307. With lawsuits pending, we now have a surreal state of affairs in which one candidate appears to be illegitimate (Clinton), though corporate media maintains a complete silence on the subject; and the other (Trump) is already warning of vote-rigging in the General Election – not a bad warning, given what happened to Bernie Sanders. The 3rd and 4th party candidates are hopeful of gathering more votes, given how much dislike and distrust prevails both for Clinton and Trump. Underlying all of this is the pronounced trend for corporate media to practice censorship through omissions and distortions, reducing important political issues and investigations to the horse race/personality contest syndrome, highlighting mutual attacks and insults between candidates, and censoring or limiting discussion of issues critical or questioning of a favored candidate (usually Clinton). From his status as media darling in 2015, Trump receives more and more media bashing the last several months, in no small part because his statements have been erratic, reckless, and at times blatantly false, in the tradition of Fox News and its many counterparts, where propaganda now often replaces journalism. This state of affairs is not unrelated to why both parties and voters are strongly polarized against each other, and have been increasingly since the late 1980s. Even so, there are journalists of rare integrity to be found who are not afraid to offend those in power by holding them accountable. Unfortunately, nowadays this brings risk of censorship, losing one’s job, freedom or even one’s life. So when Trump attacks journalists as propagandists with a heavy bias, or he complains about election fraud, he hits on some major truths here. Election vote fraud in the U.S. has reached newly scandalous levels in the 2016 Democratic Primary races, and with no coverage by corporate media on the subject, one is right to ask: Where is the outrage? Trump is the Neofascist candidate who wants to crush dissent with a larger police force. He is usually supported by Fox News, but some Right-leaning media, such as The Wall St. Journal have been critical of his behavior. Trump follows GOP policy in dismissing climate change concerns and limiting federal environmental regulations, which is why Red States have more toxic waste than any others. Trump plans to restart the coal industry, while Clinton wants to dismantle it and support more alternative energies. But she also has strong backing from the fossil fuel industries and her transition team is headed by pro-fracking advocate Ken Salazar. So while Democrats recognize climate science, their legislators are still closely tied to the fossil fuel industries. White Nationalism has been a less dominant constituency of the Republican Party, but it is now embodied in Trump, who both telegraphs it and denies it. With his unique blend of charm and abrasiveness he targets non-whites, thereby emboldening others. In mid-August 2016 Trump hired Stephen Bannon of Breitbart News as his Campaign CEO, thus essentially embracing the most extreme White Nationalists among the conservative media. Previously, Trump touted the “birther movement,” which cast doubt on whether Obama was born in the United States. More recently, Trump said that Obama “founded ISIS” and that “Hillary Clinton was co-founder of ISIS.” (Fact check: Following the invasion of Iraq in March 2003, Pres. George W. Bush, his Envoy to Iraq Paul Bremer and Sec. of Defense Donald Rumsfeld ordered the dismantling of the entire Iraqi army, thereby creating the core of ISIS. Bush permitted Bremer to rule Iraq by decree.) Trump also says: “Wouldn’t it be great if we got along with Russia?” and “I think we can make our defense much stronger [and] spend somewhat less money.” He talks tough about torture, avowing he would use as much torture as necessary, including water boarding. “What is most remarkable about the war propaganda now in flood tide is its patent absurdity and familiarity … [akin to] the 1950s when diplomats, civil servants and journalists were witch-hunted and ruined by Senator Joe McCarthy for challenging the lies and paranoia about the Soviet Union and China. Like a resurgent tumor, the anti-Russia cult has returned. The Democratic candidate, Hillary Clinton, on the other hand, is unabashedly anti-Russia and a Neocon champion of regime change and interventionism. She is the corporatist/militaristic dream president, and thus strongly supported by the all the above-named factions that insist on Trump’s defeat. This now flips the traditional standing of the GOP as the War Party, with many high-profile Republicans and even GOP Neocons now openly supporting Clinton. Victoria Nuland, wife of lead Neocon Robert Kagan, served as Spokesperson for the State Dept. May 2011 to Feb. 2013, and as Assistant Secretary of State for European and Eurasian Affairs, Sept. 2013 to the present. Some call her Clinton’s “Hawk-in-Waiting.” Meanwhile, Clinton has promised to be more aggressive than Obama in Syria, just as she pushed a reluctant Obama into the Libya invasion. She has a strong track record of hawkish policies and actions and has championed regime change in a number of countries: Iraq, Libya, Honduras, among others. With the Democratic Convention now over, Clinton has less need to appease the Anti-war wing of the Democratic Party, and is more focused on courting Republicans unhappy with Trump. We will shortly examine how the position of Mars and Sun in their respective charts reflects on their military policies and campaign styles. Gary Johnson was born Jan. 1, 1953, Minot, North Dakota, no birth time available. He has Jupiter Retrograde in Aries opposite exalted Saturn in Libra. Natal Moon is in Cancer. Jill Stein was born May 14, 1950, Chicago, Illinois, no birth time available. Her Jupiter is in Aquarius opposite Saturn (and Mars) in Leo. Natal Moon is in Aries. In Sept. 2015 Johnson and Stein filed a joint lawsuit against the Commission on Presidential Debates (CPD), demanding their right to participate in the debates. The case was dismissed Aug. 5, 2016. The CPD is a private corporation run by the Republican and Democratic Parties that has controlled the presidential debates since 1988. A 3rd party candidate may only participate in the debates if they receive a minimum of 15% in five separate and predetermined national polls. Johnson currently averages ca. 10% in national polls and Stein ca. 5%. In 1992 Ross Perot and his Reform Party won 19% in the polls and the same in the national vote. He was the most successful 3rd party candidate since 1912. Coincidentally, as with Johnson and Stein, Ross Perot has a Jupiter-Saturn opposition. He was born June 27, 1930, Texarkana, TX, 5:34 am CST (Class AA data). His Ascendant, Sun, Moon and Jupiter in Gemini oppose Saturn Retrograde in Sagittarius. Johnson and Stein vow to keep fighting the CPD, which the League of Women Voters (LWV) calls “a fraud.” Officially a non-partisan organization with progressive leanings, the LWV was founded in 1920. It ran the presidential debates in 1976, 1980 and 1984, but withdrew in protest in Oct. 1988, when the CPD took them over. Coincidentally, 1988 is the first U.S. Presidential Election for which mathematician and vote fraud expert Richard Charnin cites systemic vote fraud perpetrated by the rigging of electronic voting machines, then more widely used in the U.S. If the debate goes through as scheduled, both of them will need both spontaneity and strategy, as Kennedy showed us he could convince television viewers better than the more experienced Richard Nixon. Similarly, the actor/candidate Ronald Reagan, in his one TV debate Oct. 28, 1980 with the incumbent Jimmy Carter, both outperformed his opponent and outfoxed him by acquiring Carter’s debate briefing materials in advance. This fact only became known in June 1983 and led to a controversy called “Debategate.” Though never fully resolved, Carter still blames his defeat on the stolen papers. In 2016, Clinton, the more experienced politician, faces a former TV star. But her astrological timing is better than Trump’s; and her chart shows plenty of ability to outmaneuver him through treachery, if necessary. She and/or her campaign and the DNC have already shown this with Sanders. Further, the planets she most needs in debate combat (Sun and Mars) are both strong and ruthless. Mars is the warrior planet and rules over contests and wars. The birth chart of Hillary Clinton contains Mars Digbala in the 10th house. This means Mars is in its strongest possible angular house from the Ascendant. It gains further power located in Ashlesha nakshatra, ruled by Mercury, a great good friend of Ascendant lord Venus. Mars is also Neecha Bhanga Raja yoga; that is, as a debilitated planet it receives correction through being conjoined with Saturn in the sign of Cancer. (Saturn rules Capricorn, where Mars is exalted.) Mars is the strongest planet in her chart by Shadbala ranking, and goes to its sign of exaltation in Capricorn in the Navamsha 8th house, conjoining Rahu. SOURCE: http://www.astro.com/astro-databank/Clinton,_Hillary AstroDataBank gives a DD (Dirty Data) rating to birth times close to 8:00 am or 8:00 pm CST, though several of the Source Notes at Astro-DataBank also support a time around 8 am CST. I used my rectified time of 7:56 am CST for the extensive work I did on the 2008 U.S. Presidential Election, for which I predicted Obama’s win 10 months in advance of the election. Neecha Bhanga Mars often starts from a weaker position and can be far more competitive and combative than Mars exalted or in its own sign, where it feels comfortable. Mars Digbala demands to be in charge, and when that factor is combined with Mars in a Neecha Bhanga Raja yoga, it compounds the drive to defeat one’s competitors and enemies. Further, the other masculine fiery planet in the chart, Sun, is also Neecha Bhanga Raja yoga. Situated in the Libra Ascendant, Sun is corrected by being conjoined Venus, ruler of Libra. With the planet of aggressiveness (Mars) and leadership (Sun) both Neecha Bhanga and also in angular houses, this adds to the propensity to rise to the fight from a position that is initially weak. These two planets explain perhaps better than any others why Clinton does not accept defeat easily and will do anything to achieve her political aims, regardless of whether it is acceptable according to established rules or even laws. She does not easily accept the authority or opinion of others, though this can easily be masked by Venus and Mercury in the Libra Ascendant, giving some element of charm. Mercury has a Budha Aditya yoga and is Digbala. This bestows commanding and clever speech. The unscrupulous component comes in with planets Gandanta in a water sign and in Sarpa Drekkana, which we will cover shortly. Note too that Clinton’s Sun-Rahu Nadi yoga (exchange of nakshatra lords between Sun and Rahu) brings her an unrestrained desire (Rahu) for leadership and status (Sun), but that this creates problems for her, since Sun and Rahu are in a tense 6-8 House relation. Trump meanwhile has Sun-Rahu conjunction in the 10th house of status where Sun is Digbala and Rahu conjunct the Sun has the same effect, but gives it almost as a birthright, not as something to be clawed away at by removing any and all obstacles to achieve it. Mars conjoining Saturn in the watery sign of Cancer is more emotional than it lets on, especially in this case with Saturn and Moon exchanging signs: a Parivartana yoga. Saturn in Cancer, owned by the Moon, exchanges energy with Moon in Aquarius , owned by Saturn. The emotional idealism of Moon in Aquarius merges with the discipline of Saturn in Cancer determined to make the family work. On the one hand, this creates a Raja (king-maker) yoga between the 5th and 10th house lords from the Libra Ascendant, bringing worldly success and status. On the other hand, with Saturn at 28:11 Cancer, there is the element of treachery and deceptiveness due to Saturn’s position in the last drekkana (third portion) of the sign of Cancer, known as Sarpa Drekkana (snake-like sector). A planet or key position in Sarpa Drekkana can be volatile, unpredictable, and deceptive. This degree area is also Gandanta (last 3:20 of a water sign; first 3:20 of a fire sign), with special vulnerability at the end of water and a notable propensity for treachery associated with the last 3 degrees 20 minutes of Scorpio. Mars too is Sarpa Drekkana, since the 2nd and 3rd drekkanas of Cancer are Sarpa Drekkana, as is the 10th house cusp at 27:50 Cancer (even using whole sign houses), with my rectified time of 7:56 am CDT and Ascendant at 27:50 Libra. Added to the power of warrior planet Mars at the top of the chart is the potential for being calculating and ruthless when in Sarpa Drekkana: the perfect classic politician. Clinton may not enjoy campaigning for office, but she shows a willingness to do anything to get elected. Trump has a dominant Mars in Leo in his Ascendant, and Sun – planet of leadership – is Digbala (best possible angle for the Sun) in the 10th house with Rahu. With his confirmed birth time, we can be sure of where planets are situated in both birth and Navamsha charts. Mars goes to the 12th house in Taurus in the Navamsha chart, providing a Viparita Raja yoga. As a protective yoga for competitors, including financially, it brings advantages. This yoga occurs when the lord of a Dusthana house (Houses 6, 8, or 12) resides in its own or another Dusthana house. In this case, as Navamsha 6th lord Mars resides in the Navamsha 12th house. Other protective factors for Trump include a Jupiter trinal aspect to Ascendant lord Sun in the birth chart and a Shubha Kartari yoga to the Leo Ascendant. This occurs when classic benefic planets surround the Ascendant in Houses 12 and 2. Venus is the last planet in House 12 and Jupiter the next planet in House 2. Classic benefic planets bestow blessings and protection, including on the physical body. They ease the way in life considerably. However, classic malefic planets straddle the Navamsha Ascendant (a Papakartari yoga), so this yoga is not amplified by reappearing in the Navamsha. And though Mars is protective in this Navamsha position, it loses strength in terms of dominance in a non-angular or trinal house from the Moon or Ascendant. From an angular house in the birth chart, it goes to a Dusthana house in the Navamsha. Meanwhile Navamsha Moon-Ketu and Sun-Rahu retain angular house positions. This confirms why we saw Trump rise in prominence for the first time from Nov. 1975, when he entered his 6-year Sun Dasha (Vimshottari system). Prior to his Sun Dasha Trump was in the 20-year Venus Dasha, and Venus is in his 12th house in the birth chart. Sun is also in Mrigashira nakshatra, owned by Mars, a great planetary friend, Raja yogakaraka as 9th house lord, and strongly placed in the Leo Ascendant. This amplifies the fire power of the Sun, as does Dasha lord Rahu conjoining the Sun in the 10th house of status and visibility. Further, Rahu is exalted in Taurus. While Clinton has natal Saturn Gandanta in Cancer, Trump has two Gandanta planets (Moon at 28:05 Scorpio, Ketu at 27:39 Scorpio), and one of them is also a debilitated planet: Moon in Scorpio, ruled by Mars. Because Mars is in an angular house from both the Moon and Ascendant, this Moon also achieves Neecha Bhanga Raja yoga. It is a dramatic Full Moon, approaching a Total Lunar eclipse in just under four hours. Total eclipses have greater intensity, but the tendency to be emotionally out of control is given some greater stability through the Mars correction and Moon Digbala (Moon in its best possible angular house). We see this through the grounding Trump receives from his family and his beautiful homes (both 4th house). But since this Full Moon and Ketu are both gandanta in their most treacherous water sign placement (Scorpio) and close to a Total lunar eclipse, this gives him the exaggerated dramatic flair, the volatility and unpredictability, more so depending on the transiting planets and his Dasha sequence. Tr. Saturn in Scorpio (4th h.): Nov. 2, 2014 to Jan. 27, 2017 (aspects Leo Asc. & 5 planets). Tr. Jupiter in Leo (Ascendant): July 14, 2015 to Aug. 11, 2016. Tr. Rahu in Leo (Ascendant): Jan. 9, 2016 to Sept. 15, 2017. Tr. Mars and Saturn in Scorpio (4th h.): Feb. 20 to Sept. 17, 2016 w/one break in June. Tr. Jupiter and Rahu in Leo (Ascendant): Jan. 9 to Aug. 11, 2016 (just over 7 months). On this fixed axis in Trump’s birth chart hangs also a virtual Kala Sarpa yoga (literally “Time Serpent” yoga), when all planets are contained between Rahu and Ketu, the eclipse axis. A Kala Sarpa yoga indicates that the life is more fated and less dictated by the person’s own will. With other positive yogas present, as in this case, the Kala Sarpa yoga enables the person to play a major part in changing the society in which he or she lives. 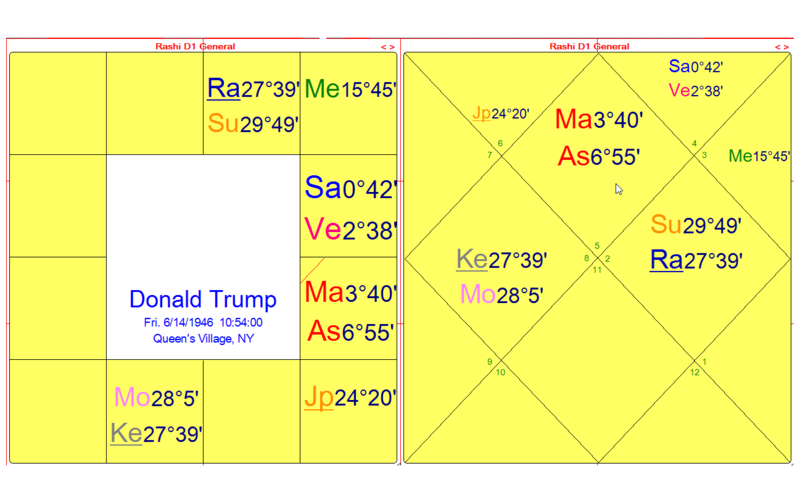 Trump’s Full Moon across Taurus-Scorpio is within 26’ orb (less than half a degree) of Rahu and Ketu: Sun-Rahu in Taurus in the 10th house opposite Moon-Ketu in Scorpio. The Full Moon is the most visible and galvanizing and Mars in Leo Ascendant further amplifies the drama of this life. As we see, everything continues to revolve around Trump. He won the GOP primaries when few pundits (including Nate Silver) expected him to survive past fall 2015. But by early Nov. 2015 he was a GOP front-runner receiving Secret Service protection. Somehow the pundits paid little attention to the huge size of his rallies from summer 2015 onward (when tr. Jupiter entered Leo), just as they ignored the at times even larger rallies of Bernie Sanders, who had a total of 1.5 million people at all his rallies. By comparison, Clinton’s rallies and audiences were much smaller, with far smaller venues. In following Trump’s progress through the campaign season, I have said that the deeper he got into the Rahu-Mars Dasha (Oct. 29, 2015 to Nov. 16, 2016), the more upsets and losses he would be likely to experience. Indeed, Trump’s biggest downturn in the polls began sometime soon after the Democratic National Convention ended July 28th. Hillary Clinton then received the typical upward bounce in the polls, but Trump never regained ground following his own post-convention bounce. This downward trend coincided within two weeks of tr. Jupiter exiting Leo on Aug. 11th. Tr. Jupiter had played this important role for Trump since July 14, 2015. Jupiter’s presence in Leo was significant because it afforded him protective and expansive powers, and it saw him successfully nominated at the Republican National Convention July 18-21, 2016. Jupiter now transits through Virgo Aug. 12, 2016 to Sept. 13, 2017. While Jupiter in Virgo benefits Trump’s finances and is also a return to Jupiter’s natal position (which is notable in its Stationary Direct degree, along with other various Dhana yogas of wealth), tr. Jupiter in the 2nd house is not in an angular house position in either birth chart or Navamsha chart. Thus, it has less power to assist him in seeking one of the world’s most powerful leadership positions, including as Dasha lord for 16 years, starting Nov. 16, 2016. A person in public life benefits more directly from a classic benefic (or Dasha lord) in an angular house, the two major classic benefics being Venus and Jupiter. For a Leo Ascendant person (Trump), Jupiter is the best benefic, since Venus is an enemy of Ascendant lord Sun. But for the Libra Ascendant person (Clinton), Venus rules Libra and is the much better benefic. For them, Jupiter is a neutral planet, but can cause trouble as ruler of the 6th house of health and legal concerns, theft, conflict, and accidents. Therefore, Clinton was much less affected by the movement of Jupiter vis-à-vis her Libra Ascendant, though it cast a 180 degree aspect on her Aquarius Moon. These factors all converge to make the last two months of the General Election campaign somewhat paradoxical. It is both predictable – in that Trump should go into decline in the last few months of Rahu Dasha, but also unpredictable – due to his dramatic personality and his many twists and turns. He may yet produce some surprises and some surprise wins fuelled by his ardent supporters. Some polls have suggested he should win at least 20 to 25 states. And given the low favorability ratings for both Trump and Clinton, the 3rd and 4th party candidates could make unexpected gains, especially with over 43% of U.S. voters registered as Independents. Once perfectly positioned to benefit the Sanders candidacy, Independents could go in different directions, unbound by the major parties and often excluded from the primary races – another way in which the Republican-Democrat duopoly retains political control in the U.S.
Trump has a potentially lucrative Dasha starting eight days after Election Day, and could cash in on a new and even more profitable chapter of his life. He will remain a fierce competitor to the end, whatever the result. And he has already warned his supporters of vote-rigging, which is by no means a hollow warning. Vote-rigging may have become a mainstay of U.S. elections, and may also get more exposed in 2016, especially with the various vote fraud lawsuits currently pending apropos the Democratic primaries, where massive vote fraud is believed to have occurred across the states. Vote fraud lawyers contest that at least 12 states were won by Bernie Sanders, not Hillary Clinton. The Jupiter-Saturn squares occur every 20 years. My analysis of these charts over a 100-year period (1916 to 2016) gives some historical perspective on the 2016 Election. See https://edithhathaway.com/u-s-presidential-election-2016/#more-1036. I show how in every case with a fixed sign square, they indicated that the incumbent candidate wins the election. Individual charts are analyzed, including that of May 26, 2016 JU-SA square in fixed signs, which shows the likely victory of the incumbent party, though I had thought it would be the insurgent candidate (Bernie Sanders), who did in fact win but was pressured to endorse Clinton. This is the first time in this 100-year period that an incumbent party is likely to win without the actual incumbent president running for re-election. Obama will have reached his term limit after 8 years in office, but he has made no secret of his wish to have Hillary Clinton as his successor to continue his legacy. He played a protective role through her several criminal FBI investigations. Prior to that he appointed her as his Secretary of State, 2009-2013. She then resigned to prepare for her upcoming presidential run, and announced her candidacy April 12, 2015. I have discussed the strengths and weaknesses of Clinton’s birth chart earlier in this article, as well as in my Dec. 2015 article (“Trump it Up”) and in my May 2015 article on Clinton. She is currently in Sun-Rahu Dasha. Together they form a Nadi yoga: an exchange of nakshatra lords between Sun and Rahu. In Nadi Jyotisha the nakshatra lord is considered as an overlord to the sign lord. And when the nakshatra lords are intertwined through planets, there is a very strong mutual influence between these planets. 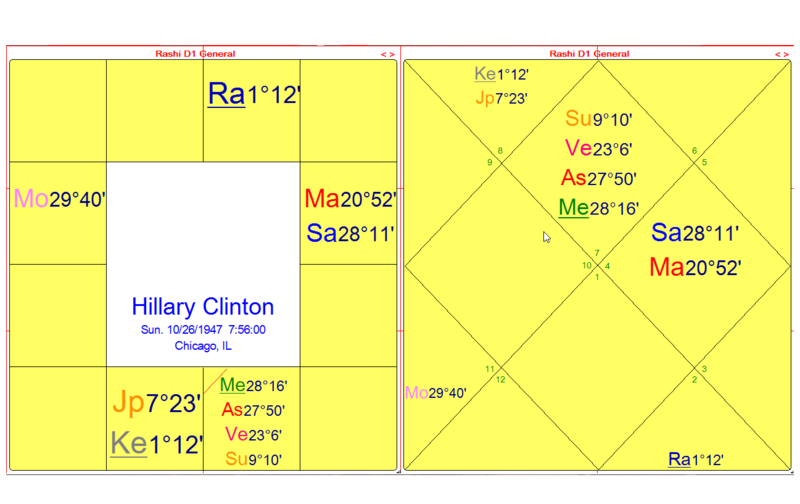 As given earlier, Clinton’s Nadi yoga brings her an unrestrained desire (Rahu) for leadership and status (Sun), but this creates problems for her since Sun and Rahu are in a tense 6-8 House relation. Sun is also planetary enemy of Asc. lord Venus. This powerful Nadi yoga becomes activated during her Sun-Rahu Dasha, from May 9, 2016 through April 2, 2017. This covers the conclusive period of the primary races, including the controversial California primary, the Democratic National Convention, the General Election, and the Presidential Inauguration Jan. 20, 2017. Prior to this Hillary was in Sun-Mars Dasha from Jan. 2 to May 9, 2016. This sub-period activates the two masculine Neecha Bhanga Raja yoga planets in her chart. We discussed earlier how Mars and Sun in angular houses, with Mars Digbala (best possible angular house for Mars) AND Neecha Bhanga could bring an even greater capacity to fight, and to do anything necessary to win the prize. When Clinton announced her candidacy April 12, 2015, she had just entered the 6-year Sun Dasha March 15, 2015. Although this was the election in which the Anti-establishment candidates Trump and Sanders had by far the largest audiences and support, and this was reflected in the JU-SA squares March and May 2016, these would come to a close by Aug. 11th. Hillary Clinton’s desire to run for the presidency, in the planning stages for decades, would find its fulfillment, even if achieved through treachery. She would not be the first to reach the presidency through treachery, and she would not be the last. Corporate scions and ruling oligarchs can overlook her untrustworthiness, as they understand she promises them one thing but has to say another to the voters at large. This is another reason why her much guarded Goldman Sachs talks could not be revealed. Only she has access to the transcripts, which she ordered at $1000 per $245,000 speech, with the proviso that no one else would have either a recording or a transcript. When asked about it at a Town Hall, she said she would “look into it.” So we can expect much more of the same from Hillary Clinton, more of the corporate elite getting what they want at the expense of the Public Good. With her boldness, determination and deceit, this is the promise of a Clinton victory in November. We see how the duopoly of the Republican and Democratic Parties is maintained through a strict control of the Presidential Debate process, among other things, though these two major political parties have been shaken up in 2016 by Trump on the GOP side, and on the Democratic side by the discoveries of the DNC complicity with the Clinton campaign, the unprecedented candidacy of Bernie Sanders, and possibly the 3rd and 4th party candidates, Gary Johnson and Jill Stein. Sanders had the misfortune to start his Political Revolution within a counter-revolutionary party, as Green Party candidate Jill Stein points out. Time will tell if the revolution Sanders inspired has much momentum outside of Sanders’ considerable leadership and direction. When he stepped aside and endorsed Clinton on July 12, 2016, it seemed to prove the point that the Democratic Party differed very little from the Republican Party in seeking to please its corporate masters. Political party members are more polarized than ever against each other, with both major parties moving ever further to the Right since ca. 1980. But we can still see a 160-year pattern that runs from 1940 to 2100 that shows how U.S. Elections will be won, at least in terms of who wins the White House. My original research on this pattern from the early 2000s is presented in my book In Search of Destiny, 2012, pp. 40-41. According to my research and study, using the close correlation of JU-SA conjunctions with U.S. Presidential Elections and/or Inaugurations, and the planetary orbits of Jupiter and Saturn within those cycles, the patterns have repeated themselves perfectly from 1940 up to 2008. This means that no matter who is elected President in 2016, though I expect it to be a Democrat, a Democrat should be elected President in 2020. This then starts a new 28-year cycle of Democratic Presidencies, interrupted only at the 12-year mark (the Jupiter orbit) by 8 years of Republican Presidents. Since the Republican Party has moved so far to the Right and split into so many extreme factions, embodied in part by Donald Trump, who is in turn rejected outright by many GOP stalwarts, we can see how it might take the party some years to find itself again and re-establish what it is about. Meanwhile, with enough seats in Congress, they can continue to obstruct the Democrats, as has happened throughout the Obama years, from Jan. 2009 to the present. But industry lobbyists continue to dictate what governments do, and they have control over many Republican and Democratic legislators. Corporations have gained power over nation-states in the EARTH period, and now those wishing to challenge this status quo need to gain power at both the state and federal government levels. The 28-year U.S. Presidential Election cycle starting in 2020 will be the first one in 80 years in this 160-year period up through 2100 that did not coincide with triple conjunctions of Jupiter and Saturn, which are relatively rare. One possible reason this 160-year pattern may falter is if it only works with triple conjunctions of Jupiter and Saturn. However, the 2020 JU-SA conjunction occurs at the Winter Solstice, within one month of the Inauguration, and six weeks after the Presidential Election. When the JU-SA conjunction fulfills these criteria (i.e. no more than several months away from either event, the closer the more impactful), there is the likelihood of the start of a new 28-year (Saturn) cycle of dominance by one party in the White House, pierced only at the 12-year (Jupiter) mark. Saturn’s orbit is ca. 29.5 years and Jupiter’s orbit is 11.9 years. Rounding these off to the 28 and 12 year marks is both convenient and coincides closely with the U.S. Presidential Election cycle. It in turn coincides closely with the JU-SA conjunctions for a full 160 years: 1940 to 2100. Also, since Saturn remains in a sign for 2.3 years on average, and Jupiter one year on average, we can safely say that at the 12 year mark, Jupiter will return to the same zodiacal sign, and Saturn will return to the same zodiacal sign by at least 28 years. As Jupiter is the Vedic planet of Dharma and Saturn the planet of Karma, the interaction of these two planets is of utmost importance for social, cultural, economic and political matters. The first 28-year run of Democratic presidents began with the election of Franklin D. Roosevelt in 1940, coinciding with the triple conjunctions in sidereal Aries. From 1940, Democrats held the White House through 1968, but were vulnerable to the opposition party taking control at certain predictable points: 1) at the 12 year mark (Jupiter’s orbital return), starting 8 years of White House control by the opposition party; and 2) when the election coincided with the next JU-SA conjunction within the 28-year cycle. This occurred at the 20-year mark in 1960, and from the 28-year cycle that began in 1980, it was in 2000. Thus in 1960 and again in 2000, both of those elections were either hotly contested (2000) or should have been contested (1960), when John F. Kennedy won by a razor-thin margin. The votes in Illinois, especially Cook county, and Texas remain officially unresolved and irresolvable. But long concealed reports from FBI electronic surveillance indicate that Kennedy’s father, Joe Kennedy bargained with Mafia and union bosses to deliver the vote for his son in several key states, including Illinois. One of the major characteristics of the EARTH period (post Mutation period, 1961 to 2199) is that Jupiter is weakened vis-à-vis Saturn, especially with the JU-SA conjunction in Capricorn, when election results can be purchased. This is why the seminal JU-SA conjunction Feb. 18, 1961 is so important in setting the tone for the EARTH period, and why we can view the upcoming four JU-SA conjunctions in earth signs with some concern, when it comes to countering corporate control (Saturn) over nation-states (Jupiter). It will need considerable effort by citizens to offset these trends of Profits over the Public Good. The next JU-SA conjunctions in EARTH take us up to 2100 before the pattern is broken by a JU-SA conjunction in sidereal AIR (0:16 Libra) Sept. 18, 2100.